City worker Chris Tomlin operates a power washer outside the city health department on Friday. Health department worker Chad Wamsley looks on, waiting his turn with the washer. Health department worker Andrew Schackert power washes a sidewalk outside the Portsmouth Health Department building on Washington Street. There were two reasons employees of the city and the Portsmouth Health Department were wandering around outside the Washington Street health department headquarters Friday. Those employees were armed with power washers, leaf blowers and other types of cleaning equipment. The idea was obviously to give the outside of the building a bit of polish, much the same polish as was to be applied to the interior of the building early this week. The main goal was to put some final touches on the health department’s bid for formal accreditation. However, the exterior work was completed with the help of the Friends of Portsmouth, the community group behind the Plant Portsmouth event slated for Saturday. Organizers of that event envision hundreds of volunteers putting a shine on Portsmouth’s downtown and the Boneyfiddle area, concentrating on Chillicothe and Market streets. They also hope to set a world’s record for the most people simultaneously potting plants. Regarding the accreditation, Ohio is the only one of the 50 states to now require local health departments to receive formal accreditation. Every health department in the state has until July 2020 to gain accreditation or risk losing grants and other funding. In Portsmouth’s case, human resources and accreditation officer Belinda Leslie said 95 percent of health department funding comes from grants. She also said, if they prove successful, the Portsmouth Health Department will be the first in Southern Ohio to earn accreditation. So far, only 14 of 120 local Ohio health departments have achieved accreditation, according to Leslie. What exactly does accreditation mean? According to Leslie, accreditation, among other things, allows the measurement of health department performance against a set of nationally recognized measuring sticks, along with what she described as continual development and revision of public health standards. “The goal of the voluntary national accreditation program is to improve and protect the health of the public by advancing the quality and performance of Tribal, state, local, and territorial public health departments,” Leslie said in an email. In speaking with the Daily Times, Leslie said accreditation comes from a 20-member Public Health Accreditation Board headquartered in Virginia. Three board representatives are slated to visit the city Thursday and Friday of next week. Leslie said no decision on accreditation is likely for two to four months after that visit. Leslie said the Virginia board will study a large number of factors. For example, Leslie talked about conducting a community needs assessment and reviewing how well the department interacts with some 20 community partners. The accreditation effort began some time ago and Leslie estimated her department has sent some 800 documents to Virginia. What exactly does the local health department do? A simple phone call to their main number provides some idea. Callers can choose from birth and death records, HIV/STD services, the immunization clinic, family planning, local Portsmouth air agency or environmental health or emissions complaints. As for the exterior clean-up, Leslie said Plant Portsmouth provided the power washers, some paint and other equipment used. The clean-up around the health department was advertised as a sort of dry run for Saturday’s much larger effort. “In one day, the image of our downtown will change immediately so we can start believing in ourselves again. Our downtown currently feels like it looks: weeds, corrosion, and desolation,” event chairperson and local attorney, Jeremy Burnside said in a press release on Plant Portsmouth. City worker Chris Tomlin was helping out at the health department Friday. He also said he would be volunteering for Plant Portsmouth this weekend. Burnside said at least 500 people are needed to break the world’s record. That might seem like a large number, but working alongside Tomlin on Friday, city worker and another Plant Portsmouth volunteer Andy Gedeon asserted that number of persons and more will be on hand Saturday. “If they were taking that line in Vegas, I’d make that bet,” he said. In addition to cleaning streets, hanging flags and planting plants, Burnside talked about the day including music and a video shoot from home-grown music star Shane Runyan. Businesses downtown and in Boneyfiddle are expected to be open all day offering special deals to persons taking part in Plant Portsmouth. Acting Mayor Kevin Johnson and other local dignitaries will hand out awards that evening to the team producing the cleanest street, to the hardest worker and others, Burnside said. The Friends of Portsmouth describe themselves as a non-profit organization for the betterment of Portsmouth and the greater Scioto County areas. To volunteer for Plant Portsmouth or for more information go to https://plantportsmouth.com. 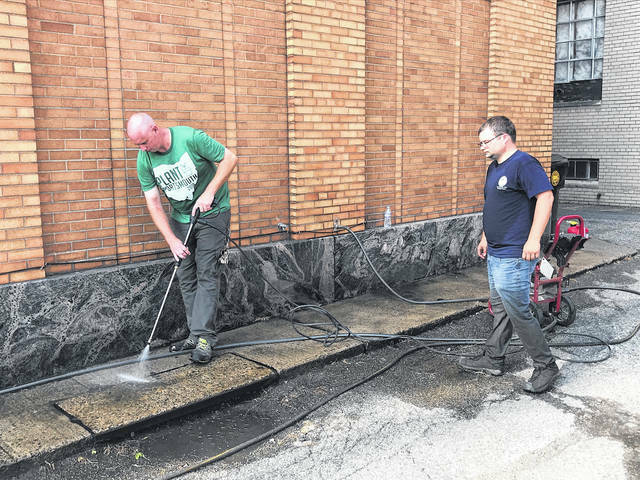 https://www.portsmouth-dailytimes.com/wp-content/uploads/sites/28/2018/08/web1_two-guys-A.jpgCity worker Chris Tomlin operates a power washer outside the city health department on Friday. Health department worker Chad Wamsley looks on, waiting his turn with the washer. 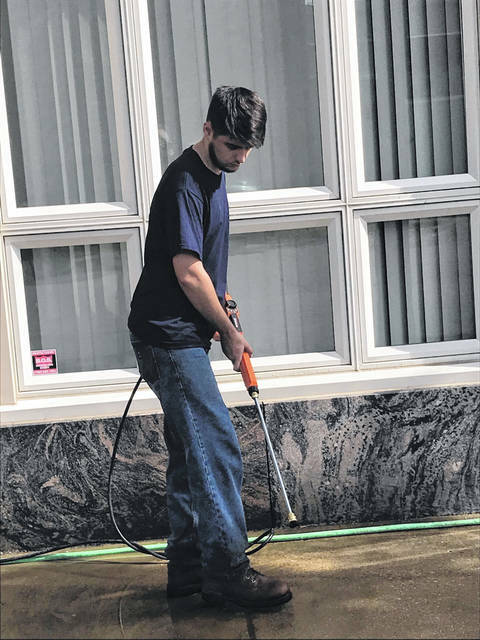 https://www.portsmouth-dailytimes.com/wp-content/uploads/sites/28/2018/08/web1_last-guy-A.jpgHealth department worker Andrew Schackert power washes a sidewalk outside the Portsmouth Health Department building on Washington Street.